It only took us one set to get Huatli’s personal-advancement color shift – that must be some kind of record! She’s probably not going to be the sort of card that goes in any deck of her color, but there are so many green-white decks that are heavy on creatures that you’ll never be short on uses for her. In such decks, she offers a relatively unique alternative because her long game is actually better than her short game. Her ultimate gives you a recurring card-advantage boost (and would have been pretty strong in the original Ravnica block along with cards like Scatter the Seeds) that will probably be quite strong against other creature decks. Boosting one creature, and only conditionally, is not quite as strong as something like Garruk Wildspeaker’s Overrun ultimate, but it is useful in its own situations. Speaking of Ravnica, I’d be remiss if I didn’t point out that Huatli’s +1 interacts unusually well with Doubling Season – and that two instances of her emblem have double the effect . . . In hindsight, with the change to how Planeswalkers work it makes a lot of sense to have two versions of a Planeswalker in a set. I was a big fan of the Warrior Poet, so how do the two compare? Radiant Champion is a lot more passive than Warrior Poet. Her first ability doesn’t exactly do anything so it’s a bit underwhelming. That being said the potential to use her ultimate the turn after you cast her is very real. Her second ability I find myself using the least but it still goes great on a Dinosaur token. Lastly, her final ability isn’t as splashy as others but the tempo will eventually overwhelm your opponent. In limited she feels a bit off. The best token generators are Raptor Hatchling, Warrior Poet, and Regisaur Alpha… all red cards. In modern I can see her shining in a Selesnya deck though. At four mana Radiant Champion is a perfect fit for the curve but I will say that Warrior Poet is the better choice in a dinosaur deck. Huatli’s second iteration reminds me, at first glance, of Gatecrash‘s Gideon, Champion of Justice. Of course, Gideon 2.0 was pretty much a resounding flop, so that’s not an auspicious start. 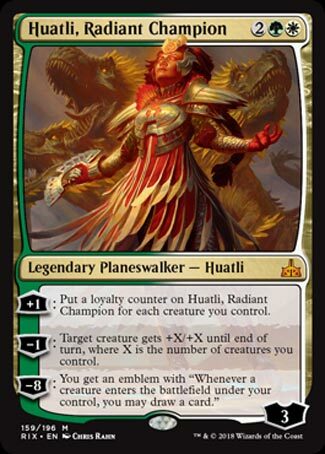 But Huatli seems to be a better planeswalker, so there is that going for her. Four mana is one of the sweet spots for planeswalker costs, and Huatli’s off to an okay start…if you cast her into a not-empty board. Her +1 puts her immediately into ult range if you have four creatures; in a green-white deck, this actually isn’t a tall order, since a number of them want to go wide and put out a lot of creatures. Her -1 also functions off of the number of creatures you control, making one creature really freaking huge. As for her ultimate…cantripping each creature is powerful. Doubly powerful is if you’re generating tokens. So…Huatli, Radiant Champion is ultimately a “win more” planeswalker. This is a good and a bad thing. The good is that, if you have a solid board, Huatli will make sure the game ends then and there, or she will put you over the top in the long haul. If your board is empty or fairly starved, though, Huatli is an awful top-deck. I can see her having a home, since the feast side of the coin is promising, but the famine side will feel really bad.